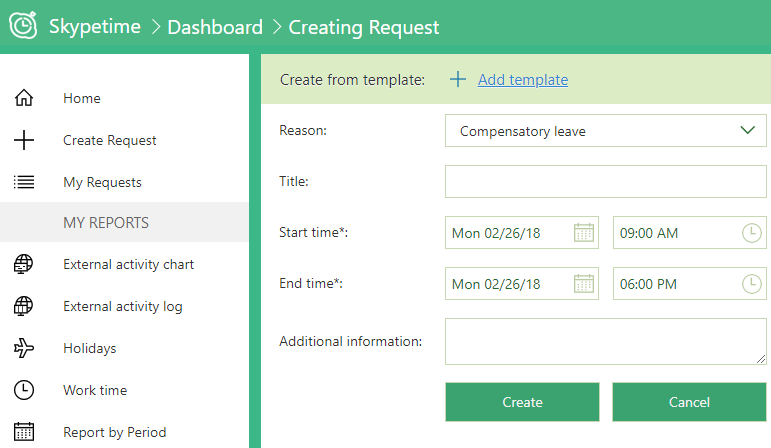 To create an application for leave, sick leave or a day off in the SkypeTime system, use the menu item Create request. The schedule of holidays is formed on the basis of the created applications. The application can be created via the SkypeTime web interface, or by sending a letter to the email address. In this case, the system will automatically recognize the keywords “Holiday”, “Day off”, “Since”, “To” … and fill in the fields with data from the letter. The new application is sent to the head of the department for approval. After the decision has been made, the User receives a notification with the updated status of the request. To speed up that process use the templates (See. “Application template”) or fill out the request manually. This section displays all the requests that the user created. In the left side panel there is a filter, in which you can set the date range, choose the reason for absence, the status of the application.